Helmut Jahn’s bold design for the State of Illinois Center (later renamed in honor of former Governor James R. Thompson) drew strong reactions when it was completed in 1985. 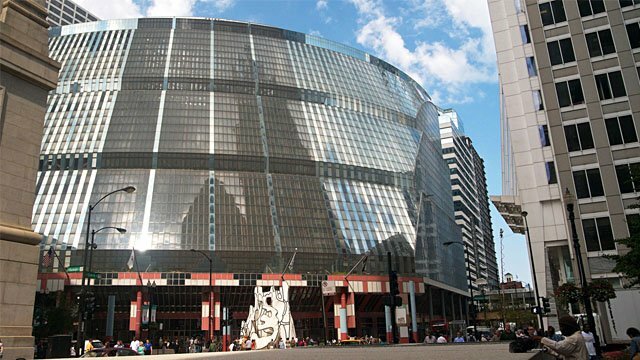 With its curving glass façade filling an entire city block, the structure was likened to a UFO that landed in the Loop; others praised it for its unique shape and open, 16-story atrium lobby. The building houses not only the State of Illinois offices, but also an extensive collection of public-owned art, thanks to a program that allocates one half of one percent of the budget of State-funded construction projects for the purchase of art. More than 150 works are displayed at the Thompson Center; the most visible is “Monument with Standing Beast” by Jean Dubuffet, which graces the outdoor plaza.